Panamax got announced today as a Human Friendly way to manage Docker. If you follow the links in the article you can find installation instructions for Mac OS and Ubuntu pretty easily. But I run Windows on my laptop. Here is how I got it going in case useful to anyone else. I had Vagrant, Docker, and Boot2Docker already installed. I am pretty sure somewhere in that installed VirtualBox for me as well (although I had to add “C:\Program Files\Oracle\VirtualBox” to my path for the following to work). My understanding is I really wanted a second VirtualBox VM running CoreOS rather than use the tiny Boot2Docker VM which runs a super stripped down OS. Here is the sequence of commands I finally got to work from inside a Cygwin bash window. Edit 8/16: the curl to fetch the images.tar.gz file is not necessary. I had a Windows version of curl in my path in front of /bin, which failed to understand /cygdrive/c/. I pushed /bin to the front of my path and that step is no longer required. I found it useful to extract directly into ~/.panamax as some of the commands in the shell scripts assumed this. They also tried to create a symlink assuming a Unix file system path (which failed), but the cd into the directory meant it all seemed to work OK (I had “.” in my path which may have helped). The first curl downloads the Vagrant files for the CoreOS etc. The second curl looks like it should have been done automatically by the shell scripts, but I did it by hand to get it to work. Then running “panamax init” created and started up the new VirtualBox image. There were a few worrying error messages along the way, but the end result is it told me a URL that worked! Up came the Panamax home page. I don’t have an opinion on Panamax yet. It looked interesting enough to investigate. It mentioned clustered hosts and using Fleet, but I have not worked out yet how powerful it is. The demos did not touch on cross server deployments. Oh, and if you are so inclined, there is a competition with $100K worth of prizes up for interesting projects completed in the next week or two. Not bad for code released as open source! 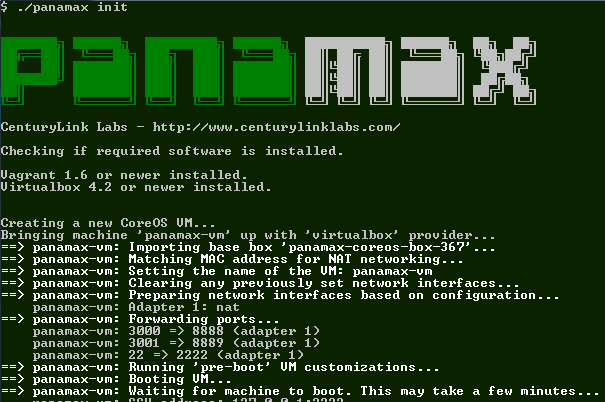 Thanks for the wonderful writeup and for documenting the steps to install Panamax on Windows. If you agree, I would like to include these instructions on the Panamax wiki page, with due credit. Thanks. Also, since ‘panamax init’ downloads and unzips the ‘images.tar.gz’, wonder if you ran into issues without this line: $ curl -O http://download.panamax.io/images.tar.gz I am curious to find out. I just worked it out – my fault. I had a Windows version of Curl in my path so it did not understand the cygwin /cygdrive/c/ path. I will update the post. Thanks for putting together these instructions. Where you say ‘I had to add .. VirtualBox to my path’ where did you do this? When I had my shell prompt, I did echo $PATH and virtual box was not in my path. I added it to a BAT file I use to set a number of environment variables before starting the bash shell – but you could do it your bash rc file instead. Virtual box was under c:\program files\ oracle somewhere (I don’t have laptop handy). Error: Warning: Permanently added ‘[127.0.0.1]:2222’ (ED25519) to the list of kn own hosts. Warning: Permanently added ‘[127.0.0.1]:2222’ (ED25519) to the list of known hos ts. Sorry, no suggestion from me. ← 360 or 3D – Which is Best for Displaying Products Online?